The Simrad AP70 is ideal for both simple installations where IMO approval is not required but also can be configured (by matching with an approved computer) to meet the requirements for a Type Approved autopilot. Install as a stand-alone display or network as a second or third station for ultimate vessel control. The AP70's stunning waterproof design, daylight viewable display, color user interface, intuitive on-screen graphics and option of flush or bracket mount, enable easy operation regardless of the installation requirements. 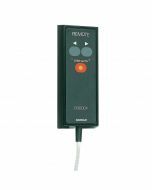 Additionally, dedicated mode, command and turn keys and rotary knob provide quick and unmistakable selection of the required function when the situation calls for immediate response. Integration with other external on-board systems including interface to central alarm units is achieved by multiple IEC 61162-1, 2 and 3 channels. The AP70 utilizes the intelligent SimNet protocol, making installation, data sharing and system control easier and more flexible than ever. The RF300 is a medium duty rudder feedback unit which connects directly to the Autopilot Pilot Computer using 2 wire frequency interface.